I loved how soft and fluffy Turbo was after a brushing, and he liked it, too. 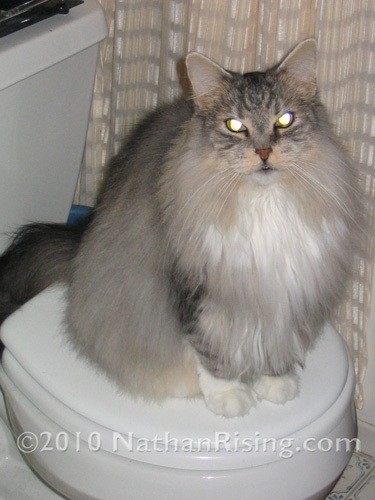 I think he took a lot of pride in how he looked, even though he NEVER, and I do mean NEVER groomed himself, which is why he always had problems with his fur getting matted. When he was brushed, he would strut around the house as if he thought he was royalty, like a glorious lion. His passing still hurts… I think about him all the time, and I often wonder if pets go to heaven. I hope they do. A family member sent us a poem called Rainbow Bridge. Every time I think about it, my eyes well up. I can only hope that after a beloved pet passes away, they wait somewhere, anticipating a reunion with thier beloved humans one day. Getting Nathan to eat with a spoon has been a challenge. I have one of those Mega Stubborn Kids. You know what I’m talking about. One of those kids… the kid who wants to do things his or her own way, no matter what. So for the past few weeks, I have diligently been trying to coerce Nathan into eating with a spoon and liking it… but to no avail. When I place the spoon in his hand, he reacts as if he’s being stung by fire ants injecting him with a poison called Independence. And he doesn’t want any of that ole Independence in his blood, no sir-ee. He screams and cries and arches his back, and the spoon invariably gets thrown across the room while food gets splattered across both of our faces. It’s funny because he wants to do his own thing and be independent, yet he balks when I provide him with the opportunity. However, when he is in JUST THE RIGHT MOOD, I can talk him into eating with a spoon. But it’s rare, as in all the planets in all the universe have to be aligned PRECICELY in one particular way while a lone toad croaks in B-sharp somewhere under a lily-pad in Siberia AT THE EXACT MOMENT a rogue asteroid collides with a comet 1.4 billion light-years away. It is then and only then then, coupled with some adult manipulation on my part, that I can coax my Stubborn One into eating with a spoon. And here is one such occasion. Enjoy. It might be a while before this happens again.